Forget the nanny state. Get ready for the conservative freak-out about the drug-dealing nanny state. 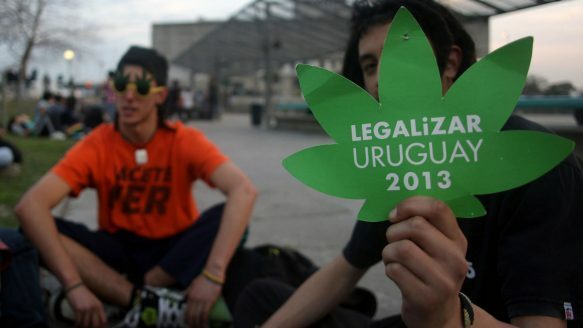 Uruguay has been moving toward full-on legalization of marijuana recently. Not just legalization, but state-controlled distribution of the drug. According to a recent article by AFP, the bill is expected to become law within the next few weeks and will take effect sometime next year. I have written more extensively here about why I think legalization is an essential part of winning the fight against drug gangs and cartels, but I see some potential problems with Uruguay’s approach. The government is going to sell its pot for $1 a gram, slightly below the current black market rate of about $1.40 a gram. The law also limits consumers’ purchases to 40 grams per month per person. People would be allowed to grow up to six plants for personal use (harvests are capped at 480 grams per person per year) or belong to a membership club that could grow up to 99 plants. I am very skeptical about the enforceability of those provisions. What’s stopping people from selling legally-purchased weed and/or “leftovers” from personal or club harvests to gangs for resale or export? Capping monthly purchases and personal harvests virtually ensures that the black market will persist. Forty grams a month is a lot of weed, but I’m sure there are people who consume more than that – especially at $1 a gram (for context, US prices run upwards of ten times that amount.) Also, I’m sure that there are people who don’t use pot at all who would be happy to act as “straw buyers” for gangs looking to export the price-controlled product and sell it at massive mark-ups in other countries. Decriminalization of all drugs in Portugal appears to have contributed to the steep decline in drug abuse and decriminalization of weed in the Netherlands doesn’t seem to have turned the country into a nation of potheads (the Dutch use pot at lower rates than Americans.) Washington state and Colorado are about a year into their legalization experiments and they have not (yet!) descended into chaos. Still, no country has ever before attempted to legalize, much less nationalize, the sale of pot. Also, the law is unpopular with Uruguayans. Portugal chose a purely free-market solution (no regulation and no taxation). Colorado and Washington chose more progressive model (some regulation and taxation). My main concern is that this seemingly well-intentioned effort will fail and that will in turn scare off other countries from pursuing decriminalization or legalization efforts in the future. If you’re trying to solve the drug gang problem, legalization, regulation, and taxation is definitely the way to go. It deprives gangs of revenue, it saves the state from spending on unproductive law enforcement efforts like arresting and prosecuting low-level dealers and users, and it the gives the state a revenue stream that can be put toward harm-reduction programs and more productive aspects of law enforcement.